What is The Trojan Horse Virus? | How Dangerous is The Trojan Virus? 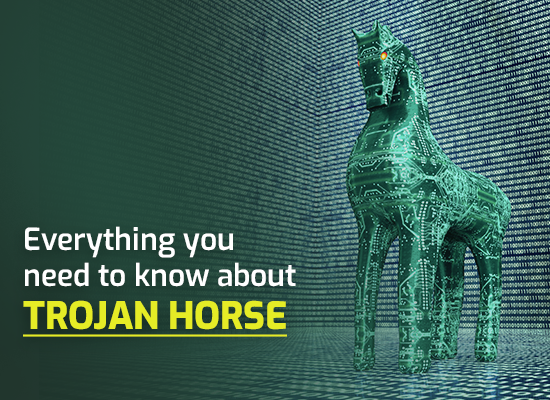 What is Trojan Horse Virus? A computer virus infects one computer to another as it travels. It affixes itself to a program or a file to execute whatever mission it has. Also, viruses don't need a human action to plague a computer. Unlike the regular virus, the Trojan horse virus can't replicate itself or even attach itself to another file. A Trojan horse virus pretends to be a legitimate file to trick the user of installing or downloading it. Despite the technical differences, they both have the same repercussions on a user's computer or even to their gadgets. Trojan horse virus is a fake file. It's a file or program that's supposed to be helpful for you but it's not. In 2017, there's a survey conducted that almost 50% of U.S. business owners didn't know that they were victims of many different cyber threats including Trojan. Thus, making Trojan horse virus one of the devious cyber attacks of all time. How Dangerous is a Trojan Horse Virus? Trojans can work as a Spyware. It'll wait until you use your online accounts or enter your credit card details. Then, it'll send your passwords and other information back to the cyber criminal. After that, the cyber criminal can perform his own plans to victimize his targets. Trojans also has the ability to change your codes or your security system. With that, even more malware can get through your security tools without getting noticed and can cause a big security breach. Cyber criminal don't just steal accounts or information, they also pester other people using DDoS attacks. In order to do that, they'll implant Trojans to computer and use it for their own interest. That will put you in great trouble as cyber crimes are detected through IP addresses of the computer. Computers aren't the only targets of Trojans. It can also use smartphones to send expensive SMS messages to premium numbers. A cyber criminal can make money through that. Don't worry. Even if it seems that Trojan horses are hard to avoid, there are a couple ways to shun away Trojan horse from your computer and gadgets. You never have to deal with the deceiving Trojan horse when you observe these simple steps. You always need to use your antivirus as often as possible. You have to make sure your antivirus is always updated. As much as possible, you have to stay out of malicious websites. You must never click attachments and malicious links from unknown emails. You need to use difficult passwords for your personal protection. Always use firewalls for keeping your personal information safe. Cyber criminals targets all types of computer and smartphone users. They won't stop 'til they get money out from your pockets. They even love to harass small time users because they don't have enough protection and advanced technical knowledge. In Comodo, we offer Advanced Endpoint protection to many businesses to improve their endpoint security even more. Comodo Advanced Endpoint Protection provides a lightweight, scalable Default Deny Platform with a unique endpoint security approach, which results in complete protection and enterprise visibility. The app based platform eliminates complexity and solution overlap. Provisioned in minutes, Advanced Endpoint Protection also includes unified IT and security management console, that through an app enabled platform reduces the effort of managing your Android, iOS, OSX, Linux, and Windows devices, on every segment of your physical and virtual networks. If you wish to learn more about the product, just visit our website for more details.